Paul Bunyan is a fictional giant lumberjack. James MacGillivray wrote about Bunyan in 1910, which is the earliest writing about Bunyan that we know about. A few years later, in 1916, William Laughead was writing an advertisement, and decided to use Bunyan in what he was writing, and decided to make him a giant. The National Register of Historic Places-listed Paul Bunyan Statue in Portland, Oregon. According to legend, when Bunyan was born, it took three storks to carry him. (In some stories storks carry babies and drop them off at their parents' houses.). When he became older, he broke every window in the house when he clapped or laughed. When he was seven months old, he sawed the legs off his parent's bed in the middle of the night. Paul and his friend, Babe the Blue Ox, dug the Grand Canyon when Paul was carrying his axe and dragging it behind him. Babe, Bunyan's friend, was a large and very strong animal. Many different towns say that they are the "home" of Bunyan. Some of these towns are in Minnesota, Michigan, and Wisconsin, although there are towns in other states, too. 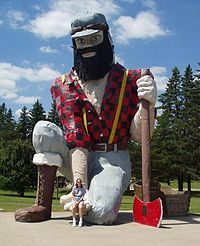 In the town of Kelliher, Minnesota, there is a park called Paul Bunyan Memorial Park, where there is a grave site that says that Paul Bunyan is buried there. ↑ "Biography – MONTFERRAND, Favre, JOSEPH – Volume IX (1861-1870) – Dictionary of Canadian Biography". Retrieved 2017-12-23. ↑ L'Heureux, Juliana. "From French-Canadian to Franco-American". www.mainewriter.com. Retrieved 2017-12-23. ↑ MMCC. "MyBayCity.com Bay City's Roots in the Paul Bunyan Tales To Be Subject of Documentary Film". www.mybaycity.com. Retrieved 2017-12-23. Wikimedia Commons has media related to Paul Bunyan. This page was last changed on 30 March 2018, at 22:05.